When I was a little boy, my dog had a litter of puppies. My father went out to the dog’s house and picked up each puppy and studied it. He held them on their backs and pronounced, “boy” or “girl.” I went to school and told my teacher that my dog had birthed a litter of puppies - four boys and five girls. “How do you know?” She asked. “My dad looked at their paws,” I replied. How do you know if a watermelon is ripe? Thumping seems to be the general consensus, but there is such a margin of error. Cantaloupes are a bit easier. Sniff the cut end and if it smells like a cantaloupe, you’re good to go. We’re faced with lots of decisions - important and lesser so - each and every day. Our survival requires that we can tell the difference between right and wrong, safe and dangerous, good and bad, just and unjust. 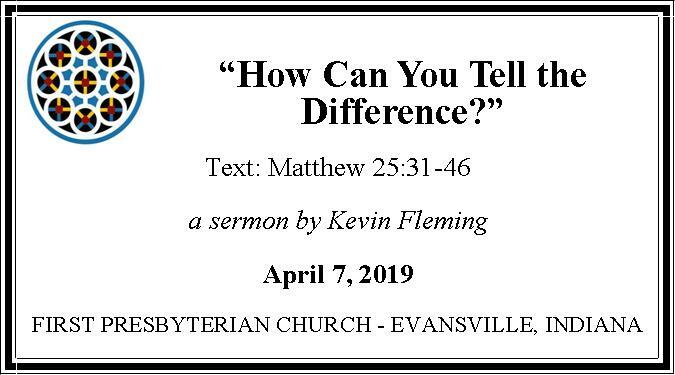 Unlike the other passages from Matthew’s gospel that we have considered throughout this Lenten season, this morning’s passage is, perhaps, the most challenging of all that have preceded it. Throughout Lent, we’ve been talking - in the broadest sense - of what it means to live as a disciple of Jesus Christ. We’ve spoken of forgiveness, acceptance of God’s invitation, and all the rest. Today, that lesson offers another view of discipleship. The image is of the end of time and the judgment that will accompany it. Now, that seems strange to us, because we tend to think of that scene as coming after Jesus’ passion, crucifixion, resurrection, and ascension. We typically read this passage in November on the Sunday we celebrate Christ the King. It’s weird that we’re reading it on the Fifth Sunday in Lent. But, that’s where Matthew has placed the story in his gospel. When you finish the twenty-fifth chapter of Matthew and turn the page, you begin reading of betrayal, preparation for the Passover and all the rest. In Matthew’s gospel, Jesus has already entered Jerusalem and has been teaching and preaching in Jerusalem. Matthew places the telling of this story in the final week of Jesus’ life. What’s up with that? And it is a story about judgment, which means we automatically don’t really want to deal with it. We don’t want to hear about God judging people - rewarding some and condemning others. We want God to love and forgive everyone and the idea that God would punish some seems antithetical to the God we claim to know. And if, as we Reformed folk like to say, we believe in being justified by grace alone, what does it matter what you did in life? Are we justified by faith? Or are we justified by what we do? Let’s begin with what should be obvious. Jesus says, “When the Son of Man comes in his glory, and all the angels with him, then he will sit on his glorious throne…and he will separate people one from another as a shepherd separates the sheep and the goats.” This business of separating the sheep from the goats is not work that is contracted out to anyone. There is no one appointed to the task of separation and judgment but the Son of Man. There is not room on the throne for more than one. There are too many people - especially those who claim to be Christian - who have taken upon themselves the business of separation and judgment. They label some people as “unsaved” and “reprobate” and “damnable.” They climb onto that great throne of judgment, reserved for Christ alone, and cast out those they simply don’t like, or those who, to their interpretation, are living against God’s will and way. Let’s begin by getting it straight: God is the judge. God’s justice is pure and without prejudice. Try doing God’s unique work and we’re getting in way over our heads. It’s one thing to talk about your faith, and call others to faith, and say all the right words. It’s one thing to stand on the street corner and trumpet your faith. It’s one thing to wear your piety like a badge of honor and seek to impress others with your holiness. But it’s a whole other thing to see a need and meet it. It’s a whole other thing to use your own blessings to bless another who is hungry or thirsty. It’s a whole other thing to put off buying more for yourself and, instead, use that money for the benefit of one who is without. It’s a whole other thing to extend yourself to another, even if it means doing without yourself. But, before we wrap up, go back to that question of why this story on this day? Why are we reading a parable about the last judgment in Lent? Why today? Well, as I told you earlier, it’s where Matthew placed the story. The story shows up in what we call Holy Week. Why? Jesus knows what it is to be the forgotten one, who hungers and thirsts. Jesus knows what it is to be unwelcome and unaccepted. Jesus knows what it is to face humiliation and degradation. Jesus knows first-hand what it is to experience injustice and maltreatment. Those people in all kinds of need - Jesus knows what that’s like, because Jesus has been there. And whenever someone recognizes the need - great or small - and does something - great or small - it makes all the difference. Indifference and detachment? Or care and compassion? Be sure you can tell the difference. And be sure you can live the difference. For now and evermore. Amen.